With all that busy hustle and bustle in Newham, East London, including finding myself out on the street for a few weeks, I can really say I love this new home in Cardiff. I remember the car journey, thinking this is still too close to all this city centre action. What I was hoping for was some lazy tranquility, lying in the sunshine with a view over a gentle stream. Too much to ask of my slave (sorry, human)? Well just look at this. 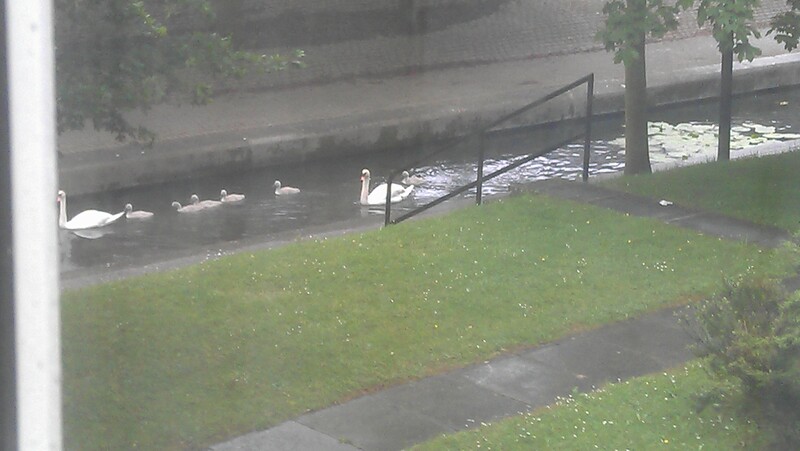 My first view is of a quiet canal, with not a sound of thundering engines, or that local band the manic street shoppers. A city centre with water and green stuff… am I in Venice or Paris? What is meow in Italian or French? But look, what I never dreamt would be possible, water-bourne lunch… who needs meals-on-wheels when you can have swimming snacks? This entry was posted in Cats in Cardiff and tagged Cardiff by Steve Morgan. Bookmark the permalink.